Terrorists cannot take Turkey hostage, Prime Minister Binali Yildirim said Friday. Yildirim made the comment at a news conference in Istanbul alongside his Bulgarian counterpart Boyko Borissov. His remarks came hours after a PKK attack in the southeastern Turkish province of Sirnak which left 11 police officers martyred, in addition to other recent high-profile attacks. “Our citizens should understand and know that we are waging all-out war on all terrorist organizations,” he added. Yildirim also said Turkey “will cause the collapse of the terrorist organization [PKK]”. At least 11 police officers were martyred when PKK terrorists detonated a car bomb near a security checkpoint in Sirnak, the regional governor’s office said. Yildirim said the PKK carried out a suicide attack on Cizre police center at about 7:00 a.m. [0400 GMT]. “No doubt, this is one of the treacherous attacks by the despicable PKK separatist terrorist organization,” the premier added. Health Minister Recep Akdag said earlier that the blast injured over 70 people, some critically. Yildirim said the military’s Operation Euphrates Shield around the city of Jarabulus would continue until “Daesh and all other terror elements are cleared from the area”. “Since the beginning we have supported Syria’s territorial integrity. The aim of these terrorist organizations is separatism in both Turkey and Syria,” he added. Yildirim said the Free Syrian Army is clearing Daesh terrorists from the region. “Our soldiers are giving them logistical support,” he added. Operation Euphrates Shield in Syria was launched early Wednesday when artillery and airstrikes were followed by Turkish tanks crossing the border to target Daesh in support of Free Syrian Army fighters. Turkey’s operation against Daesh around Jarabulus was launched “in response to terror attacks” on southern Turkey in recent months, President Recep Tayyip Erdogan has said. With a desire to form a PKK/PYD-controlled strip in northern Syria along the Turkish border, the group then targeted areas west of the Euphrates River with U.S. help. The PYD aims to sever geographical ties between Turkey and Syria using this strip, set to be completed after capturing the area between Jarabulus and Azaz and following the capture of Manbij. The group, under the SDF name, has been enlarging its area of influence since Dec. 2015 on the pretext of fighting Daesh. Yildirim also stressed the importance of visa-free travel and readmission agreements Turkey has signed with the European Union. He said not implementing the agreements “will cause the refugee issue develop into a massive regional problem that will include Europe as well”. The EU-Turkey refugee deal aims to discourage irregular migration through the Aegean Sea by taking stricter measures against human traffickers and improving the conditions of nearly three million Syrian refugees in Turkey. The deal also allows for the acceleration of Turkey’s EU membership bid and visa-free travel for Turkish nationals within the Schengen area, on the condition that Ankara meets 72 requirements set by Europe. Ankara has met most of the requirements, but the EU’s demands for changes in Turkey’s anti-terrorism legislation have led to a deadlock in negotiations. Bulgarian Prime Minister Borissov met Yildirim to discuss the refugee issue, aiming to prevent migrants from entering Bulgaria. 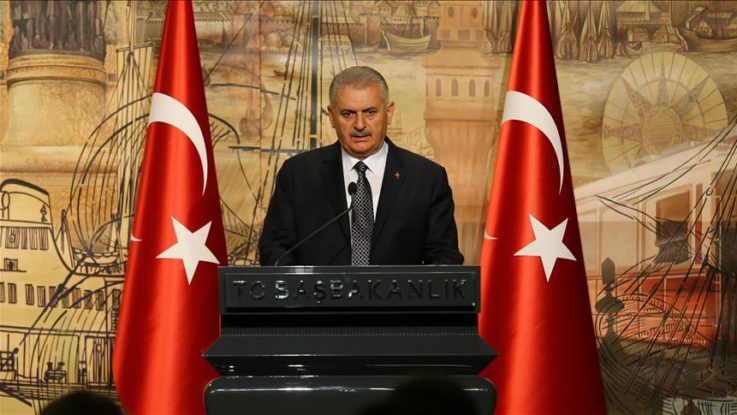 Yildirim said: “Handling Turkey’s refugee issue with Bulgaria does not mean the resolution to all problems. The Turkish premier also said the country is “clearing terror elements, including Daesh,” from the region to prevent people from migrating”.